As ancient as the towns that have settled successively in its surroundings, the hill of the Panecillo divides its history in three great moments: the time quitu-Inca, the colonial and the modern one. Quito, oil of the painter Rafael Salas that shows the city of century XIX, with the hill of the Panecillo as its backdrop. On arrival in Quitu, the Spaniards found nothing but ashes of what was the second capital of Tahuantinsuyo; But also noticed that the hill, known as Shungoloma was a strategic place in the valley of the Pichincha, so they settled the Spanish city of Quito next to the hill and baptized to this peculiar elevation with the name of "Panecillo" by its resemblance With a small bread. Some theories without greater documentary foundation maintain that in the hill there was a temple dedicated to the Sun, but there is no vestige some in the place that confirms them. Throughout the colonial period the Panecillo marked the end of the city by the extreme south, and for that reason the travelers who arrived from cities like Ambato, Guayaquil, Latacunga, Lima or Cuenca knew, when perceiving it, that their arrival in Quito was a matter of A couple of hours nothing more. The hill had a wooded part, especially in the south side. The Spaniards built a fortification at the top of the hill, which was the seat of the Quito military garrison. The fortress allowed to watch the north and the south, reason why was provided with guns. When the fort fell into the hands of the liberating army of the Great Colombia, in 1822, the Spaniards took fourteen pieces of artillery. During the War of Independence, Panecillo was the scene of a fierce battle between the royalist forces of Toribio Montes and Sámano, and the patriots commanded by Carlos de Montufar and other defenders of the State of Quito in 1812. Since 1809, Quito had expelled The Spanish Royal Audience, which settled in Cuenca. A Spanish army was sent to subdue to Quito and to reestablish the Real Hearing. On November 7, 1812, the Quito patriots confronted the colonial forces of Toribio Montes and entrenched themselves in the hill Panecillo and his fort, to avoid the fall of the city. They established a defensive line in the canyon of the Machángara river, that runs by the southern slope of the Panecillo. According to the historian Pedro Fermín Cevallos, the Spanish commander arranged three fronts to take the city from the south, and it was placed in the southern skirt of the Panecillo to avoid the fire of artillery patriot that fired from the fortín in the cusp. Then, they ascended to the castle, forcing the Quito people to abandon it. A captain named Juáregui took the fort and fluttered the Spanish flag. When the fort fell, the Spaniards easily entered the city on the northern slope, defeating the patriots. The battle lasted three hours, and died 46 patriots, and 15 realists. From the Plaza Grande and La Merced, the patriot army responded with artillery against the Spaniards in El Panecillo, who temporarily left the hill. Nevertheless, much of the park of the patriots was lost in El Panecillo, reason why they chose to leave the city towards Ibarra, where they would be finally defeated few weeks later. The Spaniards, even, minted a medal commemorating the combat, where they emphasized the triumph of the arms of Fernando VII in the hill. The medal, which some looked like a cockade in the uniform, shows a hill with two canyons, with a royal crown and Spanish flags, with the legend: "Winner of the Panecillo in Quito by Fernando." In 1822, during the Battle of Pichincha, the Panecillo fortress served as the command post of the Spaniards, who even made artillery fire against the patriots, who had ascended the skirt of the nearby Pichincha volcano. When the Spaniards were defeated, they took refuge in the fortress.4 Sucre, in order to avoid the bloody assault on the emblematic hill, sent an emissary to Aymerich to capitulate, which the Spanish captain-general accepted. According to the Act of Capitulation of May 25, 1822, the Spaniards, at 14:00 that day, lowered their flag and surrendered their arms to the Army of the Great Colombia, in a special ceremony that took place in a bridge of the Colonial fortress. Thus, at the top of the Panecillo took place the final act of the Spanish Empire in Ecuador. The fort had a large cistern or underground cistern built in brick, which served to provide water to the fort. The Spanish castle was demolished after independence, leaving only on the summit of the hill the cistern, baptized later as "pot of the Panecillo", that is conserved until the present time. Several private constructions were erected throughout the 19th and 20th century in the Panecillo and its skirts, both north and south, none of historical interest, but the terrain of the cusp remained unfinished after the demolition of the old colonial fort. Panecillo lost its military importance during the nineteenth century. The sector became dangerous during the last decades of the 20th century, being the headquarters of the famous criminal gang of Mama Lucha, which operated in its streets, which affected tourism. 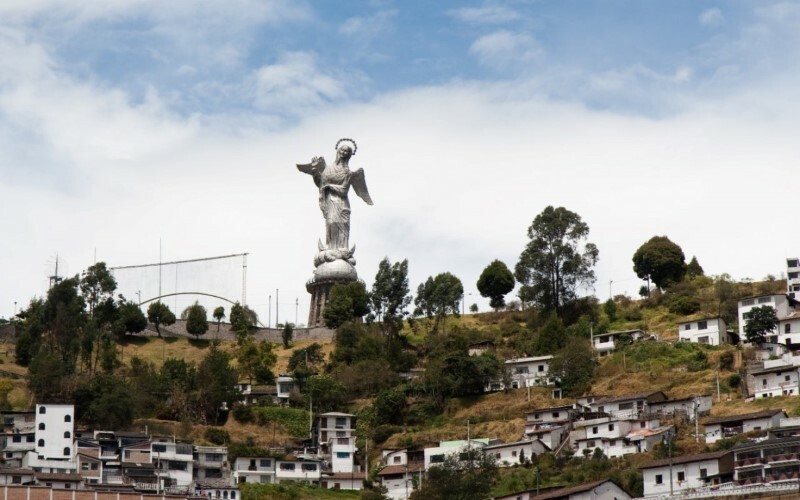 In 1976, the Spanish Agustín de la Herran Matorras made an aluminum monument in honor of the Virgin Mary to decorate the top of El Panecillo and thus also provide an icon to the Ecuadorian capital. The so-called Virgen del Panecillo is a copy of the Virgin of Legarda, and has a viewpoint and tourist center. Composed of seven thousand different pieces, this is the largest representation of aluminum around the world. The work, inaugurated on March 28, 1975, is a replica of the sculpture of 30 centimeters made in the eighteenth century by the Quito sculptor Bernardo de Legarda, the same one that rests on the main altar of the church of San Francisco, and which Is considered as the top work of the sculpture of the Quito school. The sculpture depicts the Virgin Mary as described in the biblical book of the Apocalypse: a woman with wings, a chain that holds the serpent under her feet and represents the beast of 666. 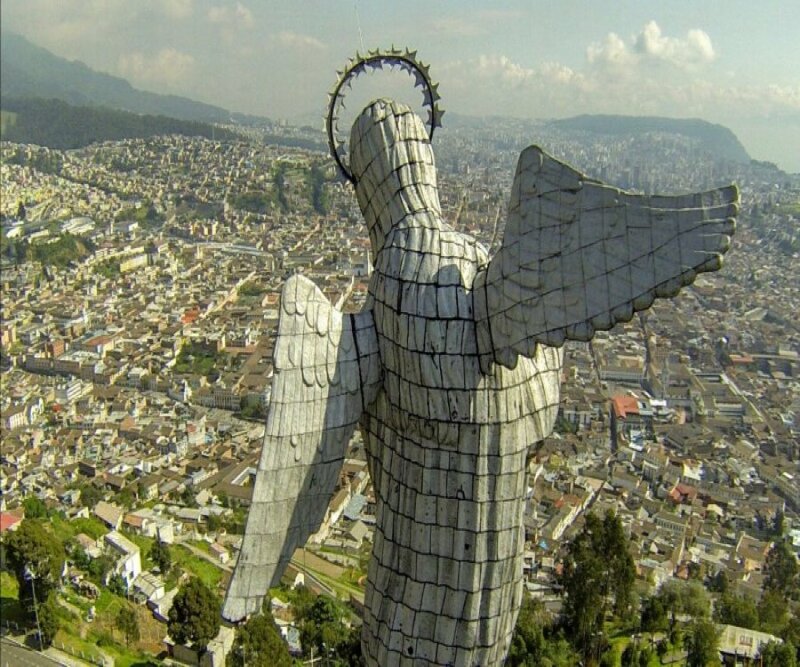 That is why Of the names of Virgin of Quito or Virgin of Legarda (for the sculptor of the original work), this statue is also called Virgin of the Apocalypse. The sculpture rests on a base building of four levels, built in concrete and covered with volcanic stone; Inside you can tour a small museum in which tells the story of the millennium hill and the construction of the sculpture. 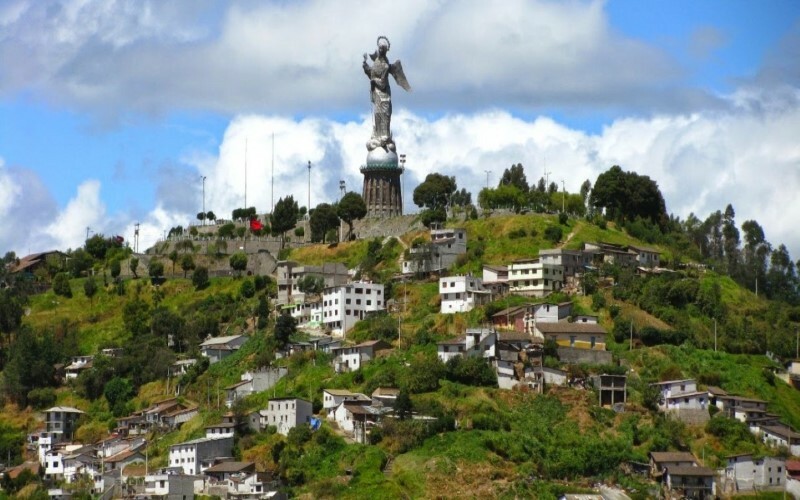 In addition, accessing this museum you can reach a viewpoint located at the foot of the Virgin, from which you have a privileged 180 degree view of the city of Quito. In its concrete base is a plaque named "The Woman of the Apocalypse (Cap 12)" written by Father Jesus Rigoberto Correa Vázquez which says: "Who is this woman, dressed in sunshine, queen of twelve crowned stars , A portentous sign, airy, winged, that to the firmament goes up erect? Who is this woman enlarged, that to its plants the moon sees prostrate, keeps the serpent in chains and among all is the only one chosen? The hope shown, in Eden, to heaven and earth, in whom God became incarnate and entered into history. It is the Mother of God, flower of the covenant, the strong woman who to hell terrifies, the slave of the Lord, the Assumption To glory. " Although it has been a site visited for many generations by its spectacular view, it is in recent years, and since the image of the mythical Virgin rests on the top, it has increased the level of visitors to the tourist center. An important part of this tourist center is the old colonial cistern, where, without any foundation, a pre-Hispanic vestige has been tried, although it is evident that it is built with colonial bricks. In spite of that, it has been decorated with indigenist motives. When the statue of the Virgin Mary was installed, Panecillo Hill acquired Catholic religious connotations, so at Christmas time a birth of lights was installed and prayers were performed like the Novena. During the first years of the 21st century, the Regeneration Plan promoted by the municipality of Quito, has favored the emergence of gourmet cafes restaurants for all tastes and pockets, a picturesque handicraft fair and a very effective community police.